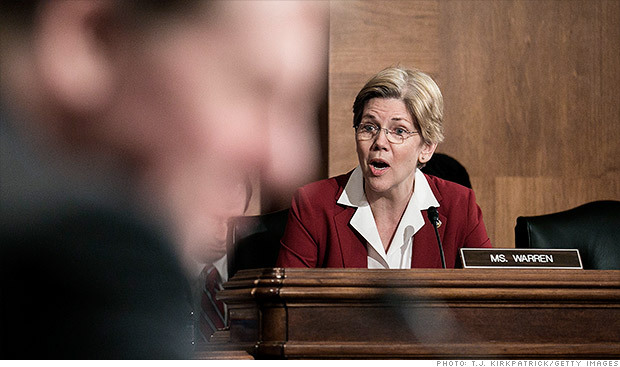 Sen. Elizabeth Warren is a new member of the Senate Banking Committee. Federal banking regulators faced a grilling on Capitol Hill Thursday as lawmakers examined their widely criticized attempt to investigate wrongdoing by banks during the foreclosure crisis. Democratic senators, including prominent Wall Street critic Elizabeth Warren, took the regulators to task over what they described as a cozy relationship between banks, regulators and the consultants hired to evaluate foreclosure cases. Warren also criticized regulators for withholding documents and information from Congress. "People want to know that their regulators are watching out for the American public -- not for the banks," Warren said. Officials from the Federal Reserve and the Office of the Comptroller of the Currency took most of the heat. The main point of contention was the Independent Foreclosure Review, an initiative announced back in April 2011 to assess potential wrongdoing by banks in foreclosure cases from 2009 and 2010. More than a dozen banks including Bank of America (http://i2.cdn.turner.com/money/.element/img/5.0/buttons/assorted_icons.gif); position: relative; background-position: -200px -160px; background-repeat: no-repeat no-repeat;">BAC, Fortune 500), JPMorgan(JPM, Fortune 500) and Citibank (C, Fortune 500) were ordered at the time to hire independent consultants to evaluate foreclosure cases for possible violations and help determine compensation for borrowers. The reviews were intended to be finished within a few months, but the process, involving over 4 million borrowers, proved far more time-consuming than anticipated. With banks having paid more than $2 billion to the consultants and the end nowhere in sight,regulators announced in January of this year that they were shutting down the reviews for most banks in favor of a bulk settlement. As a result of this settlement, the 4.2 million borrowers who were eligible for the review will split $3.6 billion from the banks, with no final accounting of how many borrowers were harmed by unlawful foreclosure practices. Warren, a former consumer advocate and Harvard law professor, questioned the wisdom of this decision at Thursday's hearing. "If you can't correctly tell how many people were the victims of illegal bank actions, how can you possibly decide how much money is an appropriate amount for settlement?" Warren asked. Daniel Stipano, deputy chief counsel at the OCC, said regulators had "greatly underestimated the complexity" of the review process, and that completing it would have delayed the compensation of eligible borrowers. "If we had to do it over again, we would take a different approach," he said. Richard Ashton, a lawyer with the Federal Reserve, acknowledged that regulators "gave up looking for individual injury" when they abandoned the reviews. A little over 1,000 households -- primarily members of the military who faced foreclosure despite laws protecting them, and borrowers who lost their homes while current on their loans -- are in line for payments of $125,000. In most cases, however, borrowers will get just a few hundred dollars, and will receive the money even if there were no violations at all in their cases. "The question is getting the right amount of cash to the right people," Warren said. She questioned whether the regulators would release individual loan data to borrowers for use in private lawsuits, though Ashton and Stipano were noncommittal on this point. Sen. Sherrod Brown echoed Warren's call for transparency, lamenting the perception that Washington is "more interested in protecting the banks than they are the public."